At CDC Ltd, we understand the value of shipping your cable on the correct reel sizes not only from a handling perspective, but also for an ease of installation. As a part of our services to our customers, we offer cable winding commonly known also as cable re-winding and cable re-spooling. 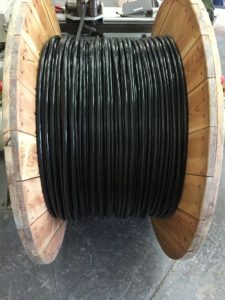 This service enables you to specify the reel size of and the length required, this means that if you require specific lengths for the different runs you are completing, we can clearly indicate the correct description on the reel itself and upon receipt, you can efficiently organise the cables speedy installation on site. If you require your cable winding into to pre-determined lengths, then we can help you in that regard. At CDC, we work closely with a number of cable distributors and stockists. One of the challenges that is often faced is specified length requirements. We can also offer cables wound to length on specified despatch reels appropriate to your customers requirements. Finally, if you require cables cut to length with end preparation, we can also offer a cable end stripping service specific to your requirements. We are happy to work on a free issue basis. For further cable enhancements, see also our cable extrusion and cable shielding pages.